It was a welcoming man with a benevolent face who opened his door to Nelson Chow, president of the sommeliers of China and Hong Kong, last October. Here, you cannot start a visit of Château Cos Labory without first observing the vineyard, standing on a stoop, at the back of the vat room. Bernard Audoy, ​​the current owner, explains the configuration of his vineyard. Cos Labory, neighbor of Cos d'Estournel, is settled on the top of the hill. The vines planted in 1961 enjoy a gravelly soil resting on clay, the Cabernets Sauvignons enjoy the view, perched on the top, while the Merlots surf the slopes. The 18 hectares of Cos Labory belong to the family since 1922. A neighboring estate, Château Andron Blanquet, entered the family in 1971. Bernard Audoy, ​​the eldest of the last generation, now presides over the destiny of Domaines Audoy. The wines of Cos Labory are at the image of their maker, fair, balanced, sincere. Bernard Audoy works by adapting the varietal to the terroir, by vinifying gently. Its ultra-modern vatroom consists of both tall and wide vats. In the cellar, the wine rests in mainly French oak barrels, renewed by 50% every year. Château Cos Labory represents on average 90,000 bottles, the second wine, Charme de Cos Labory, 25,000. The wines of Cos Labory are made to age as much as to be appreciated young. “My guideline is freshness,” says Bernard Audoy. This will be confirmed by Nelson Chow who could taste the 2016-15-14-12-11 and 10 of the grand wine and the 2015 and 2016 of Charme de Cos Labory. “The wines are fruit driven, with a nice freshness even in the 2010, a good acidity. Wines that can already be appreciated,” confirms the Chinese expert. The second wine follows the same path. We leave Cos Labory feeling lighter to have been pleasantly welcomed, satisfied to have tasted beautifully tailored wines, and moreover of a good value for money. The promise of Bernard Audoy is kept. 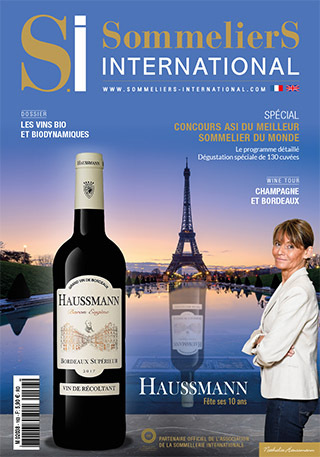 Created in 2009 by Nathalie Haussmann via Haussmann Famille, a subsidiary of the Larraqué Vins International family group, the Haussmann brand is celebrating its 10th anniversary this year.